At one point I wrote music reviews. However, about fifteen years ago, I became dissatisfied with doing so and stopped. However, for a while, I still read them. Today, I rarely do. Today I think that the value of the music review is in decline. Twenty years ago, back when music was relatively expensive, not only to buy, but just to find (it had a high acquisition cost), reviews had an important role. Buyers could read reviews, come up with a list of albums that they’d like to purchase, and then try to find these album in stores or via catalogs. Today, when we are recommended music, it usually comes along with a sample that can be freely downloaded. Whether 30 seconds or a whole track, the sample is infinitely more valuable than the review, because you can hear the music and form your own opinion. And, music is fairly cheap. For a few bucks you can just download a whole album. At that point you don’t need the review. That’s not to say that reviews are dead. Nor am I advocating that people should stop writing reviews. In fact, I think that vibrant reviews help the avant music ecosystem. Perhaps my view on this topic is not representative of many, as one of the most popular topics on AMN is reviews. So, we’ll continue to link to reviews and review sites. Nonetheless, evolutionary forces have replaced reviews with something else, and that something else is often more useful. If you haven’t played Guitar Hero or Rock Band yet, you should stop reading this, and head out to invest in one of these game systems. Why? They allow a relatively talentless guy (like me) make, or pretend to make, real music. Sure, right now the selections are mostly classic and modern rock. There’s no jazz, free jazz, classical or electronic compositions, and the instrumentation is limited. But aside from being a lot of fun, these games demonstrate the power of participation. 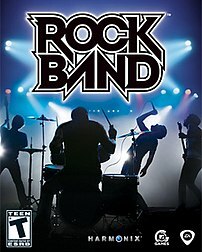 Both Rock Band and Guitar Hero have helped the ailing music industry by licensing songs and using online networks to sell additional tracks for gamers to play along with. Those tracks, which usually sell for around $2 each, are more profitable for record companies and musicians than iTunes sales. MTV, which has focused more than Activision on selling additional songs online, recently announced that it had sold 15 million tracks, and sales are especially impressive for hard-rock bands. During the week in June when Motley Crue released Saints of Los Angeles,the first single from its new album, the song sold 14,000 copies on iTunes and 48,000 on Rock Band through Microsoft‘s Xbox Live network, said Allen Kovac, founder of the group’s management company and record label. If this is where the music industry is heading, perhaps that’s a good thing. Now that the new or next generations of Rock Band and Guitar Hero allow gamers to compose their own music and share with others, how long will it be before bands release the unmixed tracks of their songs for these games? Players would then use their favorite artist’s songs as a basis for creating new music, and thus completely blurring the distinction between artist and listener. Oh, and apparently the artists can make some money in the process. Here is where I post, at a frequency of about once a week, a list of the new music that has caught my attention that week. All of the releases listed below Iâ€™ve heard for the first time this week and come recommended. Note: I missed last week because I was traveling and didn’t get a chance to listen to a lot of music.